Dr. Hohman grew up in Omaha, NE and graduated from the University of Nebraska Lincoln in 1986 with a degree in Biology. He continued his studies at the University of Nebraska Medical Center College of Dentistry in Lincoln, graduating in 1990. 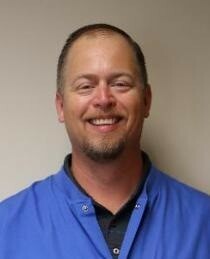 Dr. Hohman loves family dentistry and the ability to treat those of all ages. He is known for his relaxed personality, gentle touch, and ability to complete stressful dental procedures in an easy manner. Dr. Hohman and his wife, Laurie, have 2 children both attending the University of Nebraska - Lincoln. Their daughter, Allie, is a Registered Dietitian and is currently pursuing her master's degree in community nutrition. Their son, Isaac, is currently an undergraduate student majoring in microbiology. Dr. Hohman feels fortunate to have a wonderful, team-oriented staff to assist him in creating and maintaining many smiles! Dr. Hohman enjoys spending time with family, camping, boating, hunting, fishing, and attending Huskers sporting events. Dr. Hohman has a passion for dental missions, having the opportunity to treat those with little access to care. Currently he has been involved in various dental mission trips to the Dominican Republic.